DiEM25 has fielded Benoit Hamon, the recent socialist presidential candidate in France, and author Lorenzo Marsili in Italy. The starting gun for a pan-European election went off last year, when French President Emmanuel Macron suggested using the 73 European Parliament seats vacated by British MEPs to launch a new category of transnational MEPs, who will be elected in several EU member states at once. The EU thus seeks to reclaim its legitimacy as a democratic institution, but it is also an opportunity for the Eurofederalist Varoufakis, who watched the Eurozone emasculate Greek parliament in 2015. “We watched government MPs vote for measures they say they disagree with, and opposition MPs vote against them saying they will implement them when they come to power,” Varoufakis told the 600-odd people gathered in a theatre in central Athens. “That’s a comedy farce. But do you know what we’ll do? Even as they convert our parliament into a comedy farce, we shall convert theatres such as this into parliaments,” he said to thunderous applause. Austerity has alienated most Greeks from Europe, even though this had been one of the most Europhilic societies since joining the EEC in 1981. According to the latest Eurobarometer poll, three quarters of Greeks do not trust European institutions – the highest level in the EU, and higher even than Britain, which has left the Union. Partly as a result of austerity, Greece lost more than a quarter of its economy over eight years – a unprecedented record among developed economies since World War Two. Unemployment skyrocketed to 28 percent and remains officially at 22 percent. DiEM25’s ground zero can fairly be said to be Greece, the Eurozone’s only remaining underperforming economy, which continues to vex policymakers and confound predictions of recovery. Its policies here, perhaps, are most indicative of its thinking for Europe as a whole. The party calls for an immediate restructuring of debt, prolonging its repayment period and lowering the amount of money Greece has to spend annually to service it. Greece currently spends 3.5 percent of its GDP - about $8bn. Varoufakis suggests a maximum of 1.5 percent. Otherwise, he believes, austerity will recycle itself by depriving the economy of the means to reinvest in itself. Varoufakis broke ranks with Syriza in July 2015, after the party capitulated to a third bailout loan with more austerity terms attached. He says he preferred to declare a unilateral default on debt payments. With great reluctance, the Eurozone succumbed in May last year to pressure from the International Monetary Fund to consider such a debt restructuring; but it insists on doing it after Greece graduates from its current bailout loan in August, and will not commit to the depth of restructuring the IMF recommends. 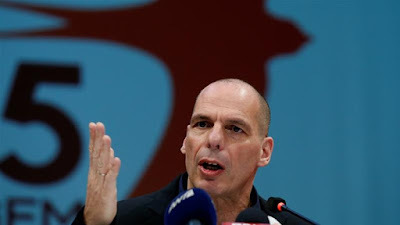 Varoufakis doubts whether Greece will ever really graduate, likening the Eurogroup’s talk of “enhanced oversight” after August to the CIA’s euphemism of “enhanced interrogation” practices. Varoufakis’ more controversial proposal is to create a taxpayer-owned ‘bad bank’ for Greece’s 105bn euros’ worth of nonperforming debt, and protect primary residences from repossession – a protection Syriza removed in 2015. His reasoning is that loans should not be reclaimed by banks while people lack the means to pay, and collateral should not be auctioned while real estate remains depressed (Greek property prices have fallen by an average 40 percent during the crisis). Banks have already embarked on a plan to reduce their non-performing portfolio by 40bn euros by the end of next year, through a combination of collections, liquidations, sales and write-offs. Liquidations, controversially, are to amount to 11.5bn euros, and include primary residences. Varoufakis’ plan would spare those properties, but he did not detail what the cost of such a solution would be to the taxpayer. Varoufakis also proposes stimulating growth by lowering sales and corporate tax on small businesses, both of which have steadily risen through Greece’s eight-year depression; but he did not provide details of how the lost revenue would be made up. Greece is projected to grow by 2.4 percent this year, more than it has in a decade, but expectations of 2.7 percent growth last year were bitterly disappointed; the finance ministry’s current estimate of last year’s performance is 1.4 percent. The lack of any reaction from Greek politicians to Varoufakis’ descent on the political scene suggests how unthreatened they feel. Two other Syriza cabinet members who thought Greece should leave the Eurozone and unilaterally stop servicing its debt formed a splinter party to contest the September 2015 election. They received 2.86 percent of the vote and did not enter parliament.